As I reflect on this past quarter, so many thoughts and feelings come to mind. 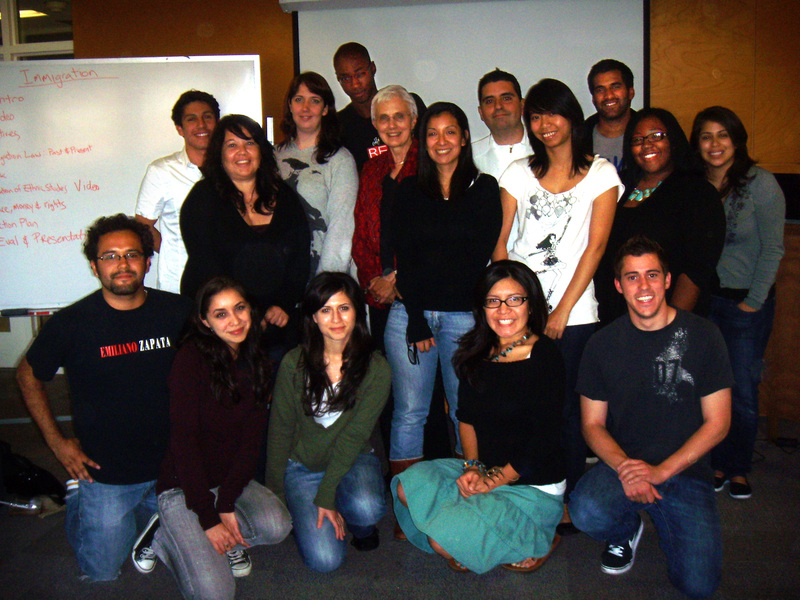 Our Critical Race Studies course has come to an end (for the quarter, that is). I’m relieved and sad. It’s a bittersweet moment. Hmm, no wait, there’s more to it. I’m also motivated and excited for the future of CRS and for my future work as a social worker with a CRS lens. Why the sadness? No other class that I have taken this past year has had such a safe environment where it is ok to talk about “sensitive” issues such as racism. (I did take another course where it was discussed, but I did not feel as safe there as I have in our CRS course). Also, in our course, we didn’t just generally talk about racism. We concretely talked about it. We discussed the shape it took in the past years through policy, media, and professional planning and social work practice, and the form it takes now. And then, we discussed how to counteract it, whether it is on a micro or macro level. What I especially loved about the course is that we discussed one of the most racist policies of our time – SB1070. This wasn’t discussed at one or two of our classes, but in almost every one of them after the bill was passed. As an immigrant, it made me very happy to be able to discuss an issue that is extremely important to me in an academic setting. THANK YOU class! You will be missed. Wow! I’ve grown a lot when it comes to leadership. For one, a year ago there was no way I could have imagined myself being on a coordinating team for a class. No way!! Now, I think it would be pretty cool to teach, and maybe I’ll do it someday. Being on a coordinating team and having a sponsoring (not teaching) faculty was a strange concept for me. I’ve always had a lot of respect for my professors and it’s always been difficult for me to see myself as an equal to them. They’ve always seemed like extremely smart individuals that could not possibly have much in common with me… Not true!! Marie invited us to her home several times, and showed us a lot of respect. She took our comments and opinions seriously and definitely made me feel valued and important. Thank you Marie! I also have to add that Susan, one of our coordinating team members, is a professor at another university. She too has treated us as equals; and has never (and I mean never) had anything close to a power trip! You’re wonderful Susan! Thank you! As I wrap this up, I have to say this has been a LONG quarter. I didn’t know what to expect when I volunteered to be one of the class coordinators. I knew it would be a lot of hard work, but I didn’t think it would be as time consuming as it has been. And this is where the relief comes along, the summer is here and now I could rest….this doesn’t mean that I’ll stop working toward our cause, but it does mean that I could slow down a little and savor the moments. We have some hopeful news. Major steps have been taken to institutionalize the course! It’s looking like Marie Kennedy will be more than a sponsoring faculty for the course next year. I don’t want to say more than I have because it’s not 100% certain yet. So please, send out your good vibes, light your candles, say your prayers, do whatever you can so that the universe could grant us our wish…our dream. THANK YOU CRS WORKING GROUP for the hard work you’ve been putting in these past few years! ALL of you are AMAZING! Memory: I am with a group of six women who I have just met through my first year MSW internship. Everyone is talking about their boyfriends. The general assumption is that if you are not sharing about your boyfriend, you must not have one. As there is no acknowledgment of the possibility of a different form of relationship, I choose to keep quiet until I can figure out whether or not my new friends are homophobic. Memory: I am at a club with straight female friends. We are constantly approached by guys all night. One guy uses the question of “do you have a boyfriend?” to discern if he should continue to engage me in conversation. I hesitate, and I say yes, because it I knew it would make him leave me alone. That night, I was not willing to find out what the intersection of sexism, homophobia, and alcohol would look like. In “Whiteness as Property,” Cheryl Harris begins by narrating her grandmother’s ability to pass as a white woman because of her seemingly European features. She writes, “Each evening, my grandmother, tired and worn, retraced her steps home, laid aside her mask, and reentered herself. Day in and day out, she made herself invisible, then visible again, for a price too inconsequential…” (276). The truth in her words elicited a sense of great of beauty and sadness within me. While I am not a light colored African American woman, I am a “straight”-looking queer Asian American woman who often engages in the act of passing as a form of survival. Because the dominant culture of America assumes heterosexuality as a norm, queer people are constantly forced to decide whether to “come out” or pass as straight. Harris’s article on whiteness as property “investigates the relationships between concepts of race and property, and…reflects on how rights in property are contingent on, intertwined with, and conflated with race” (277). In my reflection, I would also like to recognize straightness as form of property. Not only has straightness been institutionalized in the state’s biased recognition of heteronormative marriages, but it is also the condition for which one can immigrate to the United States and/or attain citizenship. Currently, U.S. immigration policies and the Family Reunification Act in particular frame normative marriages and families as the condition for immigration. An American citizen may sponsor his or her spouse of the opposite gender for immigration. He or she may also sponsor a member of his or her family for immigration. This places queer immigrants in a particularly difficult situation as their non-normative partnership is not recognized by American immigration policies. They also have the added barrier in which their families may be homophobic, and therefore unsupportive. Thus, if we are to question why American citizenship is conflated with whiteness, we must also ask why it is similarly conflated with heterosexuality. As we further engage each other in the field of Critical Race Studies, it is vital that we do not simply question race, but that we also apply the same kind of critical thinking to other dominant narratives that inform our understanding of what it means to be an American citizen. The CRS readings that we had were excellent. In particular, I enjoyed “Racialized Naturalization,” by Devon Carbado. Carbado, a young Law professor at UCLA, details his narrative as a recently naturalized American citizen. His identity as a ‘black American,” however, began as soon as he arrived in the United States, due to the perception of outside society – “Yet, I became a black American long before I acquired American citizenship. Unlike citizenship, black racial naturalization was always available to me, notwithstanding the fact that I tried to make myself unavailable for that particular Americanization process.” This story furthers the discourse on the complexities of race and citizenship, and even relates to the idea presented in another article by Volpp, that “citizenship as identity” is an elusive concept for many people of color to acquire. In other words, if you are African American, Latino, Asian, etc. your citizenship is either always questioned, or it does not come with the same benefits, rights and freedoms as it does for the dominant majority. This reality is currently in the news as the situation in Arizona grows more unjust. This scapegoating of immigrants in tough economic times is reminiscent of the CRT tenet “differential racialization” in which groups are portrayed certain ways to benefit the dominant discourse (e.g. in the early 20th century there was pervasive anti-Asian sentiment and laborers were targeted with racial violence and exclusion to citizenship and further immigration). Since I started this urban planning class I have learned that working for social justice requires incredibly intense reflection and a relentless pursuit of challenging the status quo at our often inefficient and dehumanizing school sites. As I arrive on campus each morning, I identify the many injustices that exist for students. Each day is an opportunity to create change and challenge the long existing practices that I know in my heart are outdated and unfair to students. Working towards social justice is a radical and uncomfortable movement because you are opposing an army of teachers and administrators that want to continue business as usual. This is a process that requires making mistakes frequently as you explore and seek difficult to find answers that have seldom been uncovered or acted upon before. More than anything this is lonely, exhausting and a true test of your conviction. I do not feel that I am a true social justice educator yet because I am not making change that is broad at my school. I sheepishly teach a scripted curriculum that silences my students and does not foster authentic learning experiences for them. I teach test taking strategies for standardized testing that I know do not fairly assess the capability or intelligence of my students. I see the discouragement and anxiety in their faces as we prepare for a test that is not aligned with the curriculum that I have been teaching them from. I follow a pacing guide that forces me to move on to the next chapter even at the expense of students not grasping the material. I fear my principal and associate superintendant walking into my room and finding that I am on a different page of our scripted curriculum than the other teachers on my grade level. I hear students being verbally put down by the impatient teacher next door and then accept them into my room as they are sent out because the teacher loses their cool. Even though my natural instinct tells me to stick up for this student and talk to their teacher, I do not because I have agreed to blindly stand behind the decisions of the other teachers at my school for the sake of “collaboration.” Working for social justice requires radical action and I have not taken it. At the beginning of the school year, I believed that there were many disadvantages that my students suffered from as a result of their socioeconomic status and that teachers and researchers were not yet aware of them. I believed that looking at my class through a lens of social justice would help to uncover some of them. I was confident that as I observed my students, tried out strategies, researched caring and discussed my ideas with my colleagues I would also begin to develop best practices that I would be able to use in my classroom and in the future to care for my students and ultimately share with the social justice community. Up to this point I have not lived up to my own ideals. I believed that being a social justice educator meant continuing to enter the community I work in and thinking about my research from a perspective of respect and humility. I labeled myself a learner in the process and acknowledged that I was entering my school every day with my own biased experiences and opinions. As I continue to expand my perspective on my role as a social justice educator I need to be more reflective of my own perceptions and examine how my behavior may be affecting my classroom. For me right now, being a social justice educator means taking a more critical examination of myself as I continue to interact with the community I teach in. Being a social justice educator now also means finding ways to respectfully and tactfully begin to create change on my campus, even if this involves risking being labeled by my colleagues. Being a social justice educator for me now means entering my school each day to fight for students and not to appease adults. I also believe that to continue my work as a social justice educator I need to celebrate the success that I see in my classroom. The progress and personal relationships that I have worked very hard to establish with the community I work in helps build resiliency in me. This is hard work and I believe that being a social justice educator means being uncomfortable in one’s own skin, feeling like a failure and feeling discouraged but still entering the classroom everyday with a sense of possibility. Learning about CRT has helped me grow. When I first walked into CRS class I considered social justice to be a touchy-feely hyper-sensitive field of study of peripheral importance. To my surprise, I’m walking out of CRS class with the understanding that the themes CRT elucidates are central throughout all aspects of our society. In order to see them I simply have to be aware and look for them. A good example of this is our class discussion on immigration where I had a visceral response to the idea of open borders between the U.S. and Mexico. “Whoa!” I said, “If we do that this place would be just like Mexico…” The exchange was rich with learning and growing opportunities: Let alone that this place used to be Mexico, and that our de facto open border with Canada seems to be no cause for comparable alarm, the reality that the border was created by white men to protect their interests was something I hadn’t considered. It was an opportunity for me to realize that my reaction made me a party to protecting white privilege, and also the American privilege I unwittingly felt entitled to. It was also a good lesson that I have far more growth to go. Recently, I’ve had a fascination with the fall of the Lehman Brothers in 2008 and the spread of the global financial meltdown across the world. The firms that caused the meltdown were led by CEOs and boards of global investment firms that could not tell the difference between what was right and what was wrong, thinking all along that what they were doing was ultimately right. But, this, as we know, could not have been further from the truth. All this reading, coupled with my recent investigation into critical race theory, got me thinking about how dramatically different things could have been had the leaders of this firm had more diverse backgrounds. When looking into the background of those that helmed the main firms that caused the collapse, it is hard to differentiate them based on background. Most had been privileged by their race, nearly all of them being white, and had caused the meltdown by selling and buying risky assets to people who could not afford them. This in turn promoted predatory lending, which adversely affected minorities, who were sold subprime loans when they qualified for loans that had much lower interest rates. I have constantly wondered what would have happened if the people leading these firms or executing the risky trades would have had more diverse background. Looking at the trading floor of the New York Stock Exchange or those in the deal making positions of any of the firms would yield a picture of mostly men from wealthy backgrounds that went to elite universities and did not have incredibly diverse backgrounds from one another. The reason this has so interested me is because I believe that for any organization to function adequately and successfully, diversity of thought and background must be pursued in the talent search process. In this way, the global financial meltdown is proof of this idea. That is why, when I see people, especially those in business, criticize Critical Race Theory and classes that explore issues of race and oppression, I can’t help but think that these individuals are shortsighted. They need to explore issues of diversity and understand it’s importance if they truly want to create successful organizations with longevity. If this class is granted another breathe of life within the curriculum at UCLA, I hope that we explore how critical race and business impact our society. This is extremely important as we live in a corporate driven society. What would the implications be if board rooms were dominated by minorities from low income backgrounds? Certain concepts in this course stood out most when analyzing disparities and inequalities. The tenet of the counter narrative and the value of storytelling are quite intriguing. I don’t think people appreciate the power of telling the ‘other’ story to the fullest. When integrating this tenet to the topic of race and the media, it proves its importance. Multiple times throughout the course we saw evidence of how the media misrepresents minority groups and people of color. The media has enormous power to portray people and groups in purposeful and strategic manners to benefit the dominant groups. For instance, during this time of passing the SB 1070 legislation and legalizing racial profiling, it is quite evident how news channels such as FOX illustrate immigrants in terms of criminality and unlawful behaviors to support those politicians and corporations who want to continue to take advantage of menial labor. The media shows pictures and provide stories of Latin@ families breaking the law, stealing jobs and financial resources from Americans, and even framing them as ‘aliens’ and as these ‘other’ beings that are not law abiding citizens. Sadly, the mainstream does not see the counter narratives, the real stories from these families. Most of people in society believe the common image portrayed, as opposed to the story that describes families having multiple jobs, trying to feed children, and educating young adults. Most people do not embrace the power of narratives. The narrative of those students who are fighting for the Dream Act, who attended school in the U.S. since adolescence and who are now trying to obtain a higher education to later have successful careers. This is an unfortunate reality that explains why there are always minority groups who continue to be maltreated. Are the concessions made by those in power just another case of interest conversion? If so, is progress true social transformation or can we do better by adjusting our demands or greater strategy. For example, LEED is becoming the expectation when it comes to new development. It is growing in popularity among planners and developers as climate change and its aftermath intensify. Green building is being embraced by the public and private sectors, as well as the general public. However, following the money trail, and assessing the interest of boosters, I question if LEED is an excuse to continue sprawling development. Critically analyzing new trends in planning is essential as it can detract from meeting the needs of local residents with corporate interventions guised as “green”. I consider myself to be a socially conscious person. . . . but not until my introduction to Critical Race Studied did I understand the underlined messages where racism is played. I am writing this journal in reaction to the theme we considered this week: indigeneity. I believe all of the articles this week provided me with numerous valuable insights many of which I had not been exposed to in my previous academic courses. My initial reaction to the readings is one of shock and I am also quite curious about what other histories of native peoples misconstrued throughout my academic journey. This reaction is particularly in regards to the articles related to the history of Hawaii, a history which I was completely unaware of. Like the articles mentioned, the Island of Hawaii is portrayed as region characterized by pleasure and leisure. I remember learning, as a younger student, that Hawaii was a bit different than other states in the way it became part of the union but at no time was I exposed to the real history and the demographic and social effects this had on this territory. I must admit, I too was under the impression that the island was associated with leisurely lifestyle. Now I understand that like other regions faced with territorial intrusion, the island is plagued by: increasing out migration, health issues, and elevated unemployment. I was particularly conflicted by the discussion regarding the “cultural prostitution” which has occurred on the island. It’s so disheartening to learn that the glass and steel malls in Hawaii are actually placed over ancient burial grounds. Moreover, the very conception of life: “My people believed that all living things had spirit and, indeed, consciousness and that gods were many and not singular. Since the land was an ancestor, no living things could be foreign. The cosmos, like the natural world, was universe of familial relations” (Trask, 1999, p. 3) of the native Hawaiians was completely devastated by the intrusion of US economic interests. The author further explains that the dances and the objects used for cultural practices have become commercialized and therefore robbed of their historical, cultural, and spiritual significance. Before taking this course, I have had a strong passion for social justice issues especially in regards to racial equality. While living in Maryland, I was involved in several activist efforts (ex: protests against cutting African American, Asian American, and Latino/Latina studies programs at the University of Maryland, protests for the release of the Jena 6), however after moving to California, I lacked a venue to be continuously active in the pursuit of social justice. Therefore, I entered this course with a sense of excitement to be around other people that shared a similar passion. This class has been a growing experience for me in not only learning more about critical race theory but about my passion of incorporating this perspective into my work within the social work field. “The learning process is something you can incite, literally incite, like a riot.” This quote by activist, Audre Lorde, is what I have gained through my experience in the critical race study group, the incitation of my learning. It is important that we all retain a voice that we continue to use to pursue the vision we have of a society that no longer emulates negative cultural pressures, racist ideals, internalized racism, classism, sexism, etc. This experience has provided the rejuvenation I needed to fully pursue my purpose of pursing social justice. Growing up in Maywood, it was interesting to read about it in comparison to Costa Mesa. As a child, I did not see myself as a Person of Color because neighbors, friends, and family members all who lived in close proximity, for the most part, shared a common language and culture. I remember playing in the streets with friends, going to the corner store to buy food produce (such as milk and tortillas), and such. But after reading this article, I started to imagine how life can be for those children of immigrant parents living in an anti-immigrant city. Would this child be able to move as freely as I did growing up? Would he or she be able to find support from neighbors in time of need? In a city that embraces anti-immigrant policies, movement is restricted and you become aware of your racial/ethnic profile. This was the case when I went away to college, where the majority was not Latin@. Although there were no anti-immigrant policies, I still felt restricted to enter or participate in certain spaces due to the color of my skin. In this educational institution is where I realized what it meant to be a Latina. I feel many times like I am “passing” for a white person or more precisely a person without race. I am privy to all the White conversations that would normally not be said in front of a person of color, yet I am feeling the pain of my minority friends as if it were them telling me this experience. These are conversations with future and current social workers, professors, friends from childhood that consider themselves to be liberal Obama supporters. They may go to some event for economic justice or preach equality and then in the same breath murmur something about “those people that…”. I am exposed to my Latino friends making fun of Asians, my Black friends making fun of Latinos and my Asian friends making inferences about Blacks. I absorb the content, the emotions surrounding the comments, sometimes defending my viewpoints, but many times just absorbing it so that I can put all of information together and make some sense of it. It can be a lonely place for me…and it has certainly interrupted many friendships and personal relationships. However, the people that I have met in this class have helped me…and I am thankful that I was able to have this experience. The article “And Injustice For All: Workers Live in the Reconstruction of New Orleans” demonstrated the extent of institutional racism in this country and how it negatively affects people of color and benefits businesses and the wealthy. In my view, how workers in New Orleans, specifically working class Blacks were treated was not covert racisms but it was very overt, yet nothing was done about it. The story of 2 Black landscapers with their own equipment being hired to work by a subcontractor and then not given more work when he saw they were Black was heartbreaking. Yet, people are suppose pull themselves by their bootstraps and be successful. Another example of overt institutional racism, as well as an example of contradicting policies, is the fact that businesses were allowed to bring workers from other countries with deception and then treat them like slaves while in this country; rather, than employing the community affected by the disaster or at least employ the workers already in the country. On the other hand, policies for undocumented immigrants are becoming tougher in the United States while businesses are allowed to bring people from other countries here to work. This only benefits the business owners; it does not benefit the people being brought here or the workers in this country. Why isn’t this covered in the media? Why is the government allowing business to bring people to this country and allow the business to treat them like slaves when there are so many people already here undocumented or documented citizens or residents who need jobs? when a person who doesn’ t fit into their group comes along, they don’t know how to react. My staff has discussed several ways to educate our students about race and diversity in the coming years to prevent this from happening again, but again, it’s still very disheartening. Similarity-attraction is something I could definitely see myself being a victim of. It sometimes seems natural to seek out that twin-ship in somebody, especially when you’re a minority. You might see them as a representation of yourself, especially fitting in the same category therefore seeing yourself in the same positive image. She’s black and I don’t want her touching my clothes. This expression of interectionality and oppression due to the color of the employee’s skin is a disturbing representation of how racism is still prevalent in many regions of the nation, whether it’s predominantly black or white. I experienced a bit of countertransference with this statement, considering I was the minority in a majority black race population. I felt the hurt and anger I had once experienced time and time again of being assumed to be a certain person based on the color of my skin. Note: In the narratives many students shared a lot about their lives before and outside of UCLA, but in this summary of comments I have focused only on those directly relating to experiences and reflections of the graduate programs here at UCLA. I have done this to respect confidentiality and because the assignment was to focus particularly on experiences here with an aim to institutionalizing CRT in the departments of the School of Public Affairs. I mention the Social Welfare Department (from which the largest number of the students in the class come) when a comment is specific to that department. In order to preserve confidentiality, given that there are only a couple of students in each of the other departments represented in the class–Urban Planning, Public Policy, Latin American Studies and Education–I do not link comments to those departments. This does not mean that the problems raised do not relate to those departments. Several Latin@ students were pleased by the diversity of the students and faculty in the Social Welfare Department; others (in the same department) noticed “the lack of students of color.” In a couple of cases, such different responses to the proportion of students of color seem to relate to a comparison with very different undergraduate experiences. One said, “unlike my undergraduate education, I do not feel like I am one of the few Latinos attending the program.” In contrast, another students wrote that “…with the limited amount of people of color in my department, I feel that I have been having a more difficult time being understood by my cohort than what it used to be in undergrad.” Several students decried the small number of African American students in any of their departments. The lack of faculty of color, especially senior faculty was an issue raised by several students, in all departments in the School of Public Affairs. Students from various of the racial/ethnic groups represented in our class mentioned class differences as being important. One student of color expressed that there are few low-income students in their cohort and suggested that class differences can be as much a barrier in relating to others as differences in race/ethnicity. Several students felt that more attention should also be paid to gender roles. As one student of color put it, “I feel that a lot of discrimination also has to do with gender roles in people of color.” Another suggested that, “The lack of in-depth conversations [about the intersectionality of race, gender, sexuality, (dis)ability, immigration status, etc.] in the classroom…” makes it difficult to connect with classmates. And, “there is a lack of exposure…[to] “immigration and immigrant issues.” The particular problems of undocumented students were mentioned–lack of financial aid, the demands of activism on one’s time, and general insecurity. Several Social Welfare students referred to the cross-cultural awareness class and “how many MSW students have never thought about their white privilege…” “Even educated individuals in favor of social justice feel uncomfortable with the idea that some racial groups hold privileges that others do not…” “Rather than being okay with being uncomfortable, the dominant group argues reverse discrimination.” This is reflected in the teachers too–one example given was that in the vignettes presented, “race was only mentioned if they were Black or Latino, however, not when they were White,” illustrating how racist behavior often goes unnoticed. Some students mentioned feeling patronized by other students and/or faculty who make comments that imply surprise when a student of color makes an astute comment illustrating their intelligence/competence (“…you are actually quite smart.”).